The State of Blackness: From Production to Presentation Conference brought together artists, critics, and curators to develop art education practices as a way of rectifying the invisibility of Blackness in Canadian art curriculum. It engaged participants in dialogue about the history, current state, and future of black diasporic artistic practice and presentation in Canada. The State of Blackness: From Production to Presentation was a two-day interdisciplinary conference held at OCAD University and the Harbourfont Centre of the Arts in February 2014. 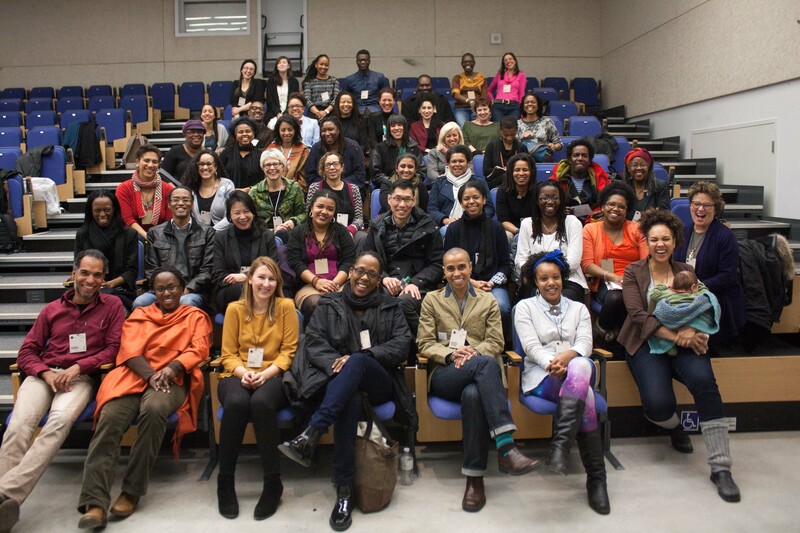 It brought together 42 artists, curators, academics, students, and multiple publics to engage in dialogue about the history, current state, and future of black diasporic artistic practice and presentation in Canada. The conference included closed working sessions and public events. Since the demise of Canada’s national black arts service organization, CAN: BAIA, in the late ‘90s, there has been little public effort to engage the multiplicity of communities and discourses that define blackness and its expressive manifestations in the Canadian context. The State of Blackness: From Production to Presentation conference was therefore a much-needed forum, as it placed issues of race and cultural difference at the center of a discussion with regards to the marginalization and simultaneous excess of Blackness in the realm of popular culture. The State of Blackness: From Production to Presentation conference created an interdisciplinary approach to teaching practices and curriculum content development in both universities and galleries. It allowed scholars and curators to network and share pedagogical strategies for disseminating the works of black artists. Documentation of the conference via podcast (include link here) archives the activities of the conference and provides research data for academics. This project served to enhance the visibility of black cultural production in the context of multicultural Canada, and broadened critical knowledge about art practices and products. While attending The State of Blackness conference, several delegates successfully proposed to further the discussion by holding another forum of Black curators during the professional preview of the 56th Venice Biennale. The conference was also the inspiration for the State of Blackness Database project. Conference participants included: Karen Miranda Augustine, Deanna Bowen, Sandra Brewster, Charles Campbell, Mark V. Campbell, Wayde Compton, Julie Crooks, Erika DeFreitas, Pamela Edmonds, Dominique Fontaine, Honor Ford-Smith, Richard Fung, Sylvia Hamilton, Jérôme Havre, Ebony L. Haynes, Johanna Householder, Camille A. Isaacs, Michelle Jacques, Alice Ming Wai Jim, Betty Julian, Olivia McGilchrist, Anna Jane McIntyre, Megan Morgan, Charmaine Nelson, Abdi Osman, Michèle Pearson Clarke, AboubakarSanogo, Adrienne Shadd, Dionne Simpson, Rema Tavares, Camille Turner, Gaëtane Verna, Rinaldo Walcott, Genevieve Wallen, Syrus Marcus Ware, and Natalie Wood. Photograph of conference participants by Ella Cooper. Accelerating Duchamp is a re-thinking of the modernist artist Marcel Duchamp’s practice in the culture of late capitalism. Specifically, this research project will focus on his creation of the readymade, works of art chosen but not produced by the artist, in relation to both the rationale of consumer society. This research project involves a significant re-thinking of Duchamp’s importance in the 21st century, specifically proposing a Duchampian form of accelerating culture. I locate the aesthetics of his practice, most notably the readymade, within current theories and debates around consumer capitalism and the question of the object. This research is explored in two main projects. The first is a book titled Duchamp, Aesthetics, and Capitalism, which will be published by Routledge. In this book I propose what I call an accelerated Duchamp that speaks to a contemporary condition of art within our era of globalized capitalist production. The second is an international Duchamp symposium that will bring together scholars who are actively pushing Duchampian research beyond the given confines of the current historicized understandings of his art and practice. 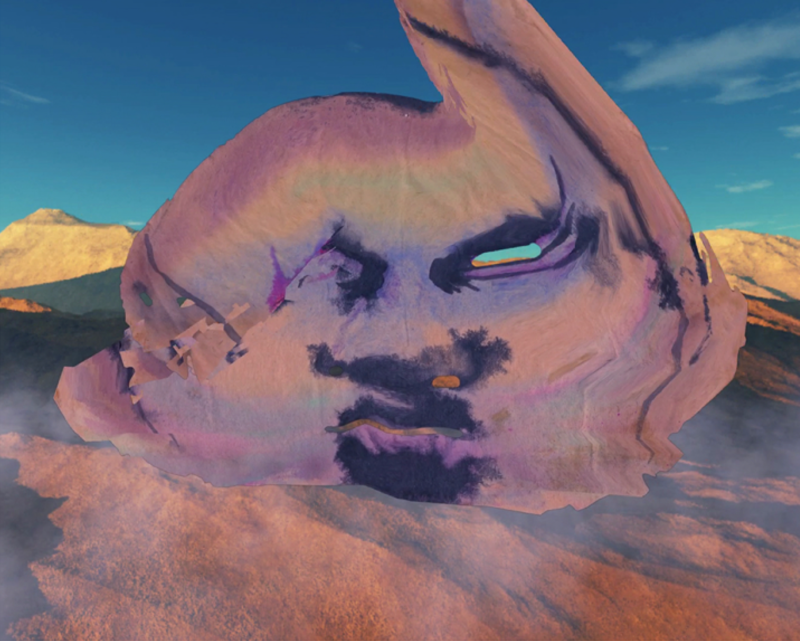 Quipucamayoc is an interactive art and technology project that merges a range of contemporary art forms – including 3D gaming, electroacoustical music, dance, experimental theatre, and wearable design – to construct a prototype communication network. This network is not based in text or language but is instead embodied, performative, and sensorial. 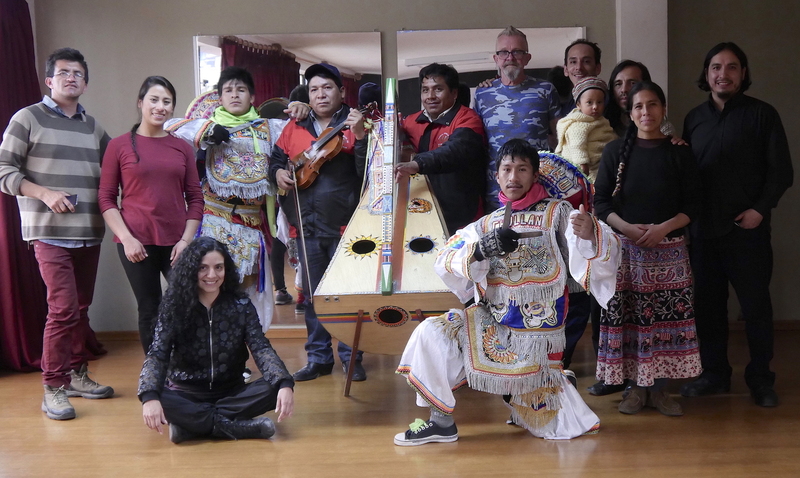 The network joins two Andean communities: one in Cusco, Peru, the former capital of the Incan empire, and another in Buenos Aires, Argentina, which has a large expatriate community of Peruvian Andean migrant workers. The network is activated through wearable technology inspired by quipucamayoc, the data keepers of the Incan court who recorded information about life in the empire using a complex string and knot notation system which they wore around their bodies. Body sensor arrays, which serve simultaneously as game controllers and musical instruments, are worn by movement artists to co-create live interactive generative narratives, imagery and music. 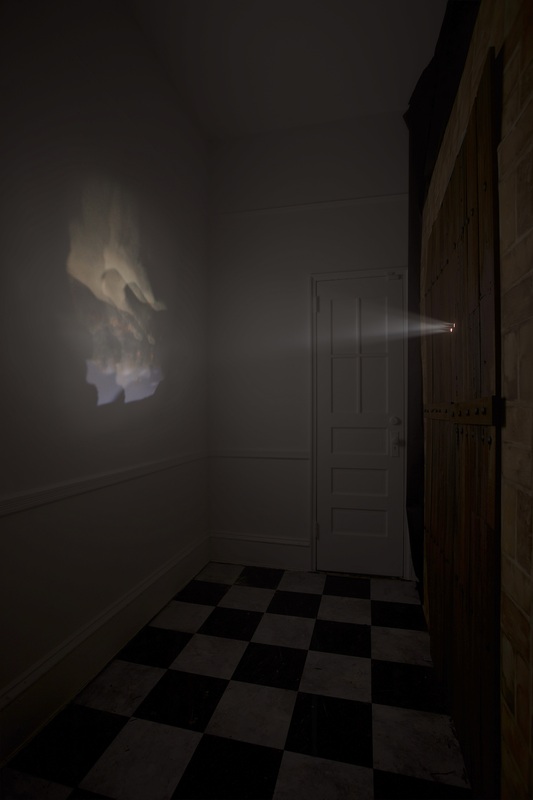 The result is a public performance which reconnects two communities through interactive gameplay based in their common histories. 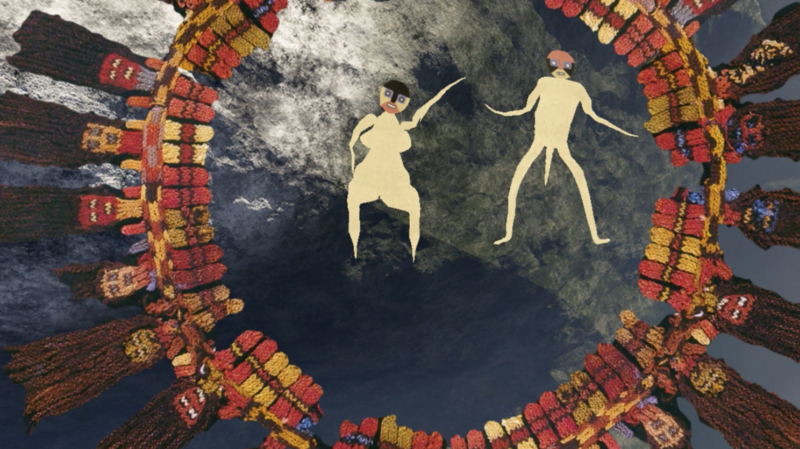 This project was inspired by the Huarochiri Manuscript, a 16th century written compilation of pre-colombian Andean religious rites, which offers a complex and fragmented narrative structure as well as rich visual and sound passages. 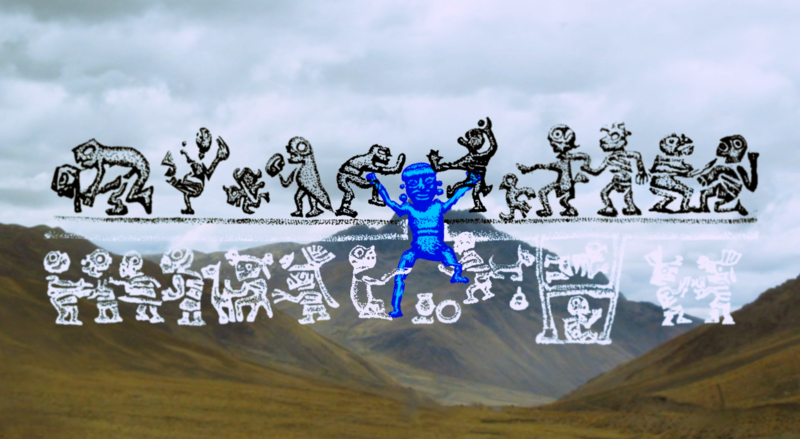 Quipucamayoc was developed and presented by a collective of over 35 artists, historians, cultural theorists and technical experts in Peru, Argentina and Canada. 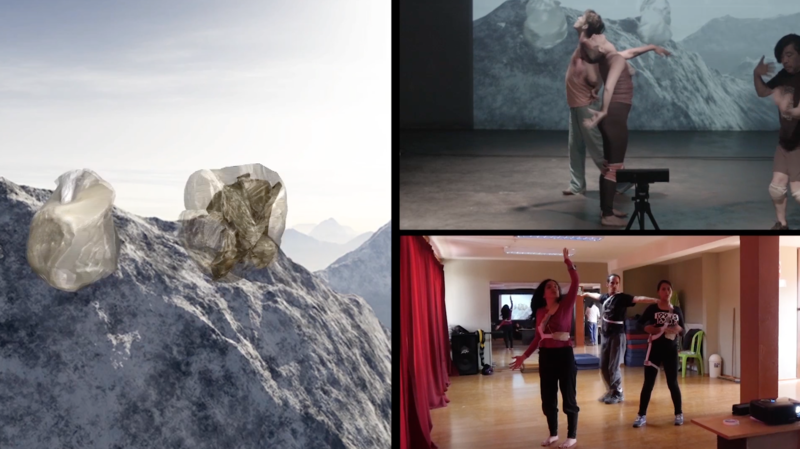 The audiovisual materials listed below are the result of a series of workshops held in Cusco and Buenos Aires between 2012 and 2016, and the final performance which was streamed live online in December 2016. The Quipucamayoc documentary can be viewed here. 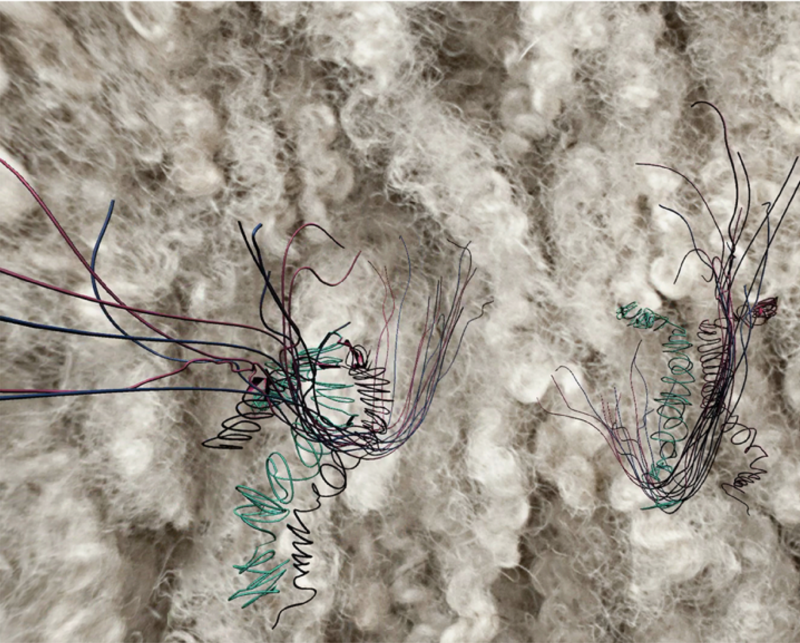 Quipucamayoc also produced a series of 2D digital prints on canvas, adapted from 3D virtual environments. These prints were exhibited in a group show of the Faculty of Art Summer Institute from September 18 to 22nd, 2017 in the Ada Slaight Galleries at 100 McCaul. Quipucamayoc es una investigación de arte y tecnología que combina varios formatos artísticos contemporaneous – videojuego 3D, música electroacústica, danza, teatro experimental, diseño textil, sensores vestibles – con el objetivo de construir una red de comunicación que no es textual o linguística, sino corporal, performativa, sensorial. Esta red reune Cusco, Perú, y Buenos Aires, Argentina a través de artístas de movimiento usando trajes como controladores de juego e instrumentos musicales, por lo que los bailarines serán los cocreadores de música, de imágenes 3D y de una narrativa generativa/interactiva en vivo. La inspiración de este proyecto es el manuscrito del Huarochirí, texto del siglo XVI que recopila ritos y mitología andina prehispánica, reconocido por su narrativa fragmentada, compleja, por sus pasajes riquísimos en imágenes visuales y sonoras. Quipucamayoc fue desarrollado y presentado por el colectivo de más de 35 artístas, teóricos y técnicos peruanos, argentinos y canadienses. Los materiales audiovisuales presentados han sido producidos durante una serie de talleres en Cusco y Buenos Aires entre 2012 and 2016, y el performance final que fue transmitido en línea en vivo en Diciembre 2016. When Canada’s first citizenship laws came into effect in 1947, photography had already been representing this mode of belonging in the country for more than 50 years. Citizen Subjects explores this unique context that allowed Canadian citizenship to emerge as a subject of photography long before it became a legal category. 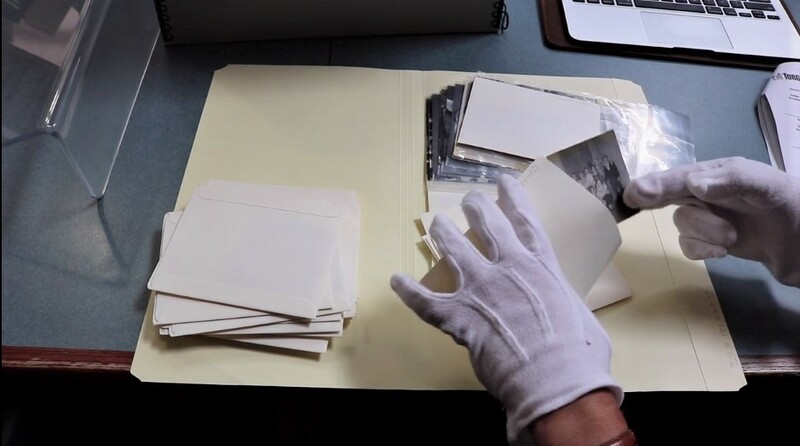 Building on research conducted in local, municipal, and national archives from coast to coast, this multi-year research project explores the intersections of photography, race, and citizenship, testing the promises—and limitations—of visual representation in securing identities and rights. To visualize the effects of changes to citizenship and immigration law, with the potential to inform Canadian policy formation. Comprising exhibitions, scholarly articles, a series of newly commissioned public installations, and an interactive website that allows users to build a visual vocabulary of citizenship, this interdisciplinary project invites audiences to think critically about questions of belonging in and around Canada’s sesquicentennial year. How did subjects use the camera to make claims for equality as citizens before the law offered them any such protections? What are the gestures, expressions, poses, and modes of dress that we recognize as performances of citizenship? How were race and citizenship imagined, and pictured, alongside one another? Citizen Subjects is framed around an important date in thinking about the history of visuality and citizenship it Canada, focusing on the period leading up to the enactment of Canada’s first citizenship laws in 1947. These were, somewhat unbelievably, the first citizenship laws in the British Empire. The period between the end of the Second World War and the start of the Cold War is important for thinking about Canada’s relationship to global and transnational politics, because it marks a host of other nationalist and de-colonial movements happening worldwide, including the passing of the United Nations Declaration of the Rights of Man, the partition of India and Pakistan, the start of apartheid in South Africa, and the destruction of Palestine and the creation of the state of Israel. Examining race and citizenship between 1946 and 1948 therefore illuminates how Canadian visual culture participates in global and transnational movements, and also forces the spectres of the transatlantic slave trade and settler colonialism—two global processes foundational to twentieth century politics—to come back into the frame of how we picture belonging in Canada. In a contemporary moment marked by increasing restrictions on citizen rights, such as the recent cap on Syrian refugees permitted into Canada, public debates about the global refugee crisis, and political movements such as Idle No More and Black Lives Matter, the project of building a visual vocabulary of citizenship takes on political urgency for a wide range of audiences in Canada. By examining how citizenship appears in photographs, Citizen Subjects develops critical knowledge about why certain subjects continue to be left out of legal framings of citizenship and builds the public’s visual literacy for recognizing current claims to citizenship by immigrant communities, people of colour, and Indigenous subjects. Instudio Article "Picturing Race and Citizenship — with Dr. Gabrielle Moser" by Heather Beaumont"